Arrive Delhi meet assist at airport, welcome with fresh flower garlands and transfer to your respective hotel. Overnight at hotel. 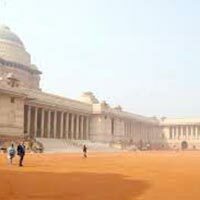 Delhi- India’s capital and a major gateway to the country. New Delhi also reflects the legacy the British left behind. The division between New & Old Delhi is the distinction between the capitals of the British & the Moghuls respectively. Tourist Attractions: Jama Masjid, the largest mosque in India. Built by Shah Jahan, the construction was started in 1844 and was not completed until 1658, Red Fort, which was also built by Shah Jehan. 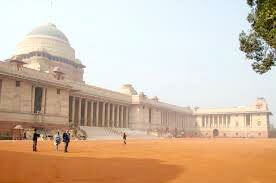 This massive fort was built from 1638 to 1648, Chandni Chowk and Rajghat - the cremation site of Mahatma Gandhi. Witness the India Gate, the Presidents House & the Parliament, Qutab Minar. After breakfast transfer to airport for flight to Varanasi. 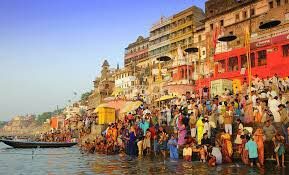 Arrive Varanasi meet assist at airport and transfer to your respective hotel, Afternoon visit to Sarnath, where Buddha turned the wheel of law and delivered his first sermon. In the evening witness an Aarti ceremony. 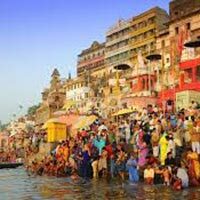 Early morning boat cruise on the Holy River Ganges followed by the tour of the city. Later take a one hour flight to Khajuraho. Evening visit Khajuraho- amazingly short span of 100 years, from 950 AD - 1050 AD, saw the completion of all the temples, in an inspired burst of creativity. Today, of the original 85, only 22 have survived the ravages of time; these remain as a collective paean to life, to joy and to creativity; to the ultimate fusion of man with his creator. Overnight Khajuraho. After breakfast drive by private a/c car to Jhansi railway station for Shatabdi Express train to Agra enroute visit Orchha. Orchha- was founded in the 16th century by the Bundela Rajput chieftain, Rudra Pratap, the most notable was Raja Bir Singh Ju Deo who built the exquisite Jehangir Mahal. Jehangir Mahal Built by Raja Bir Singh Ju Deo in the 17th century to commemorate the visit of Emperor Jehangir to Orchha. On arrival Agra transfer to hotel. Day 6: After breakfast city tour . After breakfast visit to the world famous Taj Mahal Agra is best known for the Taj Mahal, one of the Seven Wonders of the modern World. Taj Mahal- Reflects the intensity of love. Taj Mahal, which was constructed by Shah Jahan in memory of his wife Mumtaz Mahal. Agra Fort -Built by the great Emperor Akbar in 1565 A.D. the fort is a masterpiece of design and construction. Itmad-Ud-Daulah’s Tomb: Often described as ‘jewel box’. After breakfast drive by private a/c car to Jaipur enroute visit Fatehpur Sikri. Fatehpur Sikri- Built by Emperor Akbar in 1569, was the old capital of the Moghuls, which was abandoned after 15 years due to scarcity of water. The sloping levels of the city were connected into terraces which were utilised for various complexes such as Jami masjid, Buland-Darwazah and tomb of Sheikh Salim Chishti; Khass Mahal, Shahi-Bazar, Mina-Bazar, the Panch-Mahal, Khwabgah, Diwan-i-Khass, Anup-Talao, Chaupar and Diwan-i-Am. On arrival Jaipur check into your respective hotel. 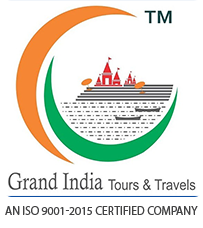 Evening: - Chokhi Dhani visit for traditional dance show of Rajasthan with Indian style dinner. 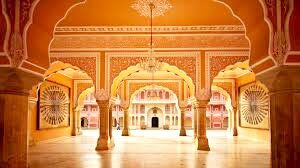 Jaipur- The capital city of the state of Rajasthan also know as “Pink City” owes its name, its foundation and planning to the great warrior astronomer Maharaja Jai Singh II. The city of Jaipur has broad avenues. excursion to Amber Fort. Elephant ride from the foothills of the Aravallis to the fort entrance. Amber Fort: At a distance of 11 kms from Jaipur, Amber was the ancient capital of Jaipur state. Afternoon, city tour of Jaipur. Visit the City Palace which has museum having an extensive collection of art, carpets, enamel ware and weapons; Jantar Mantar – the observatory built my Maharaja Jai Singh in 1728 and the façade of Hawa Mahal. After breakfast drive by car to Jodhpur, on arrival transfer to hotel. Afternoon city tour. Jodhpur- Nestling within the depths of the Thar Desert is the stronghold of the Rathore clan - Jodhpur, once the capital of the former princely state of Marwar, the second largest city of Rajasthan, after Jaipur. The town was once known as Marwar, which means ‘Land of Death’, probably, referring to the harsh desert climate. Tourist Attractions- Mehrangarh Fort It is situated on a 150m high hill.. There are a number of attractions within the fort like several palaces, galleries, a museum, temples and so on, other attraction Jaswant Thada, Clock Tower and Sardar Market, Umaid Bhavan Palace. One of the most romantic cities in Rajasthan, Udaipur is also known as the city of lakes. The marble palaces, beautifully laid out gardens and the lakes make Udaipur seem almost like a mirage. 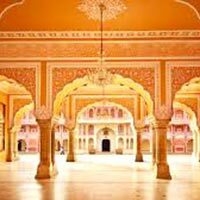 Other attractions: City Palace & Musium, Saheliyon-ki-Bari, Pratap Memorial, Gulab Bagh, Pichhola Lake The picturesque lake that entranced Maharaja Udai Singh. After breakfast Morning at leisure to relax. Evening transfer to Udaipur airport for one hour flight to Mumbai. Arrive Mumbai meet assist at airport and transfer to your respective hotel. After breakfast city tour of Mumbai, following the first war of Independence in 1857, the East India Company was accused of mismanagement, and Bombay reverted to the British crown. For the day visit Gateway of India, Prince of Wales Museum, Hanging Gardens on the slopes of Malabar Hills offering nice view of Marine Lines & Chowpatty Beach, Kamla Nehru Park, Mani Bhawan (where Mahatma Gandhi used to stay) and then to Dhobi Ghat. Also visit Afgan Church, Flora Fountain (Bombay nerve centre), Colourful Crawford Market and Marine Drive. Morning Leisure at hotel, evening final departure transfer to Mumbai airport for your flight back to home. 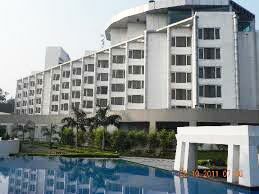 Hotel The Royal Plaza is a boutique hotel located at the heart of the business and commercial hub in New Delhi. It offers easy access to most corporate and financial centres, ministries, diplomatic missions and the International Trade Fair grounds. 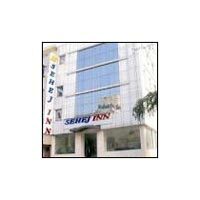 Hotel The Royal Plaza is an ideal accommodation choice for business and leisure travellers in Delhi. Hotel The Royal Plaza boasts 415 luxurious guestrooms combining warmth and exceptional service. These rooms have been designed with guests comfort in mind. They are equipped with state of the art amenities. The lobby is decorated with a beautiful fresco made by Italian artists, precious and semi precious stones inlay work, 24 carat gold art work as well as Onyx and marble layouts. Hotel The Royal Plaza has several dining venues to suit all tastes. Guests can relax and sip a favourite drink at the bar, dance the night away at the discotheque, get pampered in the beauty salon, swim or exercise at the gym. 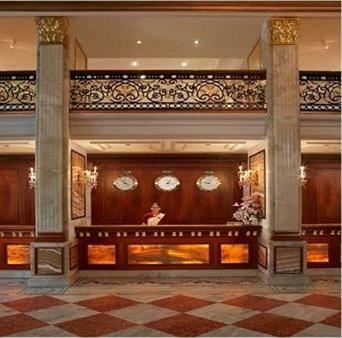 In this stunning Delhi hotel, guests can be sure to have a unique and memorable experience. The property offers superbly appointed meeting rooms which are perfect for all kinds of events in New Delhi. Events ranging from small scale meetings to large conferences with 20 to 800 people can be organised. Excellent banqueting service is provided with a touch of class and professionalism. Hotel The Royal Plaza is also an ideal venue for wedding functions, cocktail dinners and celebrations.